Former Vice President, Atiku Abubakar, has threatened to drag a chieftain of the Northern Elders Forum, NEF, Mr. Paul Unongo to court for alleging that he is a financier of the association of cattle breeders, Miyetti-Allah. The erstwhile Vice President, in a letter that was signed by his lawyer, Mr. Mahmud Magaji,SAN, asked Unongo to immediately retract the allegation which he said was ” blatant and malicious falsehood”, or face legal action within seven days. Atiku insisted that the said retraction must be published in all the national dailies in Nigeria. Specifically, the ex-VP who made particular reference to a publication he said was on page 3 of the Punch of January 6, 2018 (Vol. 7413), asked Unongo to within 30 days of receiving the letter, pay him N200billion as damages. 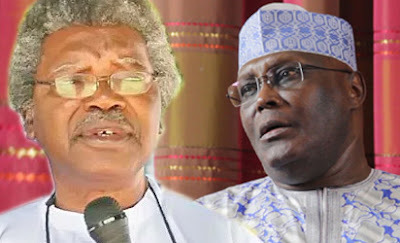 Unongo was reported by the media to have claimed that he had interacted with Atiku and knew that he (Atiku) was the most powerful person financing Miyetti Allah, a claim the ex-VP had since denied.